I’m going to try to not repeat information already published about the Ghia limousines. In Special-Interest Auto #14, published in 1973, is the definitive article about Ghia Crown Imperials with many factory photographs and references from original Chrysler employees and engineers. I’m going to leave that superb article as the basis , and really make it required reading, for this publication to make sense. The difference between my assumptions/assertions and others who have written about these cars is that I own six of them, consisting of five different production year models, that I have personally disassembled and reassembled, observed and photographed. As with any handmade car, and indeed some production built cars, variances from year to year, car to car and day to day exist. However, most of my conclusions are drawn by observing numerous vehicles and their consistencies and variances in production. I became interested in Ghias because I always had an interest in limousines. I was a Chrysler guy and a Dodge dealer. I had a collection of 55 automobiles, over a third of those were limousines of various makes. Ranging from 1939 to 1984, this collection was a result of my fascination with what I considered the last true factory hand-built cars. 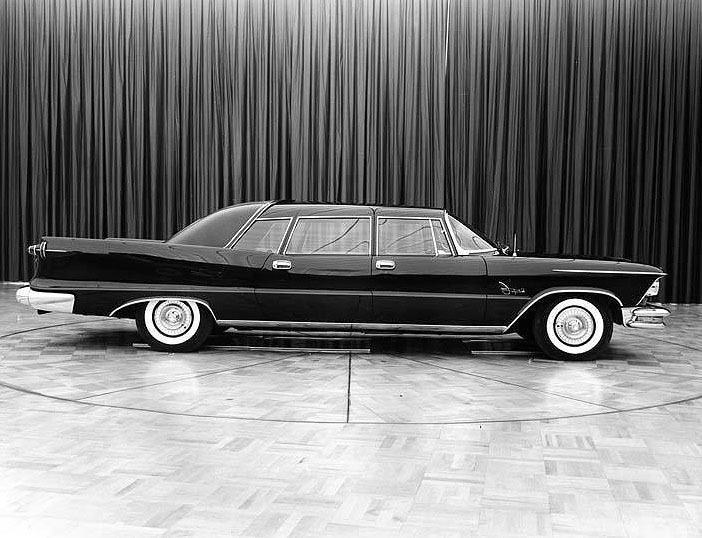 As with the Ghia, the Cadillac limousines as built by the factory, were vastly unique from their production counterparts, being built in separate facilities and having very few common parts. The Ghias were truly an exercise in marketing. Whether or not they ever turned a profit on any of the cars they produced was not the point. The point was prestige and the buzz created by offering an Italian bodied car on what was (in 1957) a rocket ship of futuristic styling. It was really cool slapped on top of really cool. My intention was to restore, to the highest level, one car from each year model of Ghia production. I would then take those cars and campaign them at various events in an effort to popularize what I thought is an overlooked piece of history. I also commissioned reproductions of various Ghia parts (more than I would ever need) to offer them to people that I might convince to also undertake a Ghia restoration. My plans have changed and I have carried out the complete restoration, or over-restoration I should say, of just one of the vehicles. I don’t stitch interiors, I don’t paint exteriors, I leave that to the artists who truly know how. Everything else though, I have done. And when I say I have done, I have really done. Every single item on this car, without exception was completely disassembled, fasteners re-plated, refurbished, repainted, or replace with NOS parts. That includes: the dash assembly, doors, divider, engine... everything. In reviewing the pictures, I’ve attempted to describe where I deviated from original materials or finishes. Of particular note, is the undercarriage of this car. All Imperials, especially Ghias, had a crazy amount of undercoating applied. For the average restoration, factory undercoating is a positive because old undercoating is just sprayed with new undercoating and bingo it’s restored. Unfortunately, undercoating usually hides numerous sins. The type of undercoating used in the ‘57 to ‘59 cars would dry rock hard. Over the years, portions of it would separate from the car but remain attached to the surrounding undercoating creating pockets. These pockets would then get water in them and create an incredible amount of rust. Any Imperial that has not had the undercoating removed from the bottom of the car or out of the trunk is not truly restored. We purposely left the underside of this car bare to show off the extent of Ghia work and restoration metalwork. We then used modern materials to insulate from the inside of the car. This was never intended to be a money-making enterprise. I wanted to preserve a piece of Chrysler history and to elevate one of these cars to the WOW status that only a few restored cars actually achieve. Too often these rusty, crusty old girls are purchased by unknowing buyers. Unaware of what it takes to truly restore a car. Another half-assed paint job is applied, a less than Ghia level interior is installed, and the car is not really preserved because of all the underlying problems of rust, mechanical decay and loss of the true nature of what the Ghias were. Equal to or greater than the quality Ghia supplied, only the finest of sub-contractors were chosen for my restoration. The chrome on this car was done in two of the nation’s premier chrome shops. The level of NOS parts on this vehicle is unprecedented for any Imperial or Ghia. This car was intentionally over-restored but at a tasteful and respectful level. The intention was to draw the eye of the judge or connoisseur to create an appreciation that was not there before. The paint is dead flat and superbly applied, all the original lead work was redone with lead (with a thin Bondo overcoat to promote paint adhesion) and the interior, which from Ghia was like a hand made Italian suit, was redone by one of the nation’s foremost street rod trimmers. Even the interior woodwork was done by highest level cabinet makers. Because all limousines, no matter what their make, are overlooked as collector vehicles the cost of restoration will always far exceed the money someone else will pay for it. So, building a Ghia the right way can be interpreted as either as an altruistic preservation of history or the actions of a raving lunatic. For me, I suppose it’s a little bit of both.